Ho Chi Minh’s researching style is one part of his style manifested in his thinking and writing, and most importantly, his practicing in reality. His conducting research style represented a process starting from rational awareness, conceiving the ideological and theoretical values of the previous generations to form his theses and apply them reasonably into practice. Basing on the realities of Vietnam and the world, Ho Chi Minh applied and developed Marxism – Leninism, creatively pointed out the revolutionary venue for Vietnam. He confirmed the true value of Marxism – Leninism as “the most reliable, the truest and the most revolutionary” and he affirmed that “Marxism – Leninism is the lodestar” for our entire Party, people and troop. On the other hand, during his course of leading Vietnamese revolution, he also studied to apply basic principles of that doctrine into reality and then supplemented and developed it with more valuable theses. Study must be in-depth and included with surveys. Respecting objective reality became the fundamental of all Ho Chi Minh’s actions. Before making any decisions, he always studied, collected enough information, based on theoretical and practical basis to shape effective measures without subjectivity. He required his cadres and party members to make a habit of working on the basis of respecting the reality, not to distort the truth. He demanded his cadres to work with a vision basing on the reality and scientific forecasts about related situation, not to be passive or surprised or focusing on trivial things. He strongly criticized cadres who are bureaucratic, reality-mindless, or “near sighted”. Such cadres could only see small things with little impact in front but not the more valuable ones behind. Thanks to his experience and his reality mindfulness, Ho Chi Minh and the Party Central Committee made important decisions in the turning points of the history. Once finding out irrelevant policies, he timely requested amendments in an objective and dialectical manner. 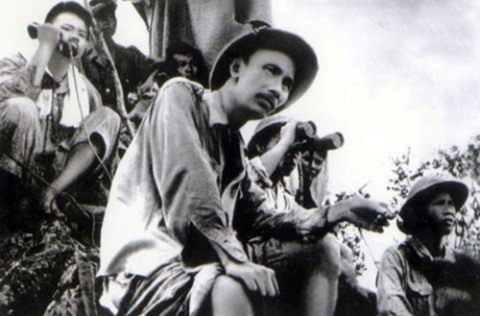 In the resistance wars as well as in the building of socialism, prior to each campaign, each battle or each guideline and policy, whether big or small, Ho Chi Minh discussed with the Party Central Committee to appreciate subjective and objective situation, advantages and disadvantages, solutions and possible changes of the situation to timely make correction and supplementation. To have in-depth studies, Ho Chi Minh spent a lot of time going to localities and staying with his people and enjoyed the lives of ordinary people for thorough study of the situation. To thoroughly understand the situation of localities, he was also sensible in employing the political system, cadres and advisory agencies to get necessary information. During his leadership, he always exercised democracy so that all party members could express their ideas and propose initiatives. With his sense and objectivity, he knew which information was valuable and which one was not, then selected the valuable one for studying and taking action. Study must be purposeful, basing on concrete, detail and careful plan, conducting it in scientific manner with focal points to achieve relevant results in a specific period of time. That was a content of Ho Chi Minh’s scientific style. He thought that doing any thing should include a clear target. Scientific style requires that working and studying, whether in short term or long term, should have detailed plans with clear aims, tasks, contents…. Ho Chi Minh’s great contributions to Vietnamese revolution, namely his popularization of Marxism – Leninism to Vietnam, his leading of the entire nation in the General Uprising in 1945 and the two resistance wars against the French colonialist and the US imperialist, were all based on detailed program and plan with careful preparation in all aspects, particularly his practice studying. As a result, he can anticipate the situation and made correct decisions. Planning should be scientific and brought into play. Plans are for implementation, not for fun. He criticized those who made plans without considering the capability of the personnel who implemented them. He required that those who made plans must know how to accomplish them flexibly. He applied the principle of “firm in objectives, flexible in strategies and tactics” to understand and find out solutions for matters of tactic and strategic importance harmoniously and effectively. Study must be associated with inspection, supervision, and review. Grasping Lenin’s viewpoint that leading without checking means no leading, all directives and resolutions are just a pile of waste paper, Ho Chi Minh thought that each work, when finished, regardless it is successful or not, should be reviewed carefully and drawn out lessons for others. It is the key to progress. A researcher must know how to make use of their system, partners, advisors scientifically and effectively and must regularly check the implementation of their affiliates and of the mass. To that end, he/she must always conduct self criticism and review his/her words and actions to promote good things and overcome weaknesses while being open to criticisms from others. Ho Chi Minh attached special importance to practice reviewing and drawing lessons so that he could timely adjust and supplement the inadequate and inappropriate guidelines and more importantly he could supplement his own theories. As a leader, he regularly and systematically carried out checking and inspection from the higher levels to the lower ones to assess his cadres, party members and the appropriateness of the guidelines and policies. In conclusion, Ho Chi Minh’s style of scientific studying is of profound practical meaning, particularly to the present scientific researchers. To shape scientific researching style, it is necessary to continue educational renovation and improve the awareness of Ho Chi Minh’s thought and studying style. In the meantime, we should effectively implement the Directive 05-CT/TW of the Politburo (XII tenure) on “Strengthening the study and following Ho Chi Minh thought, moral and style”. It is necessary to make cadres fully aware of the meaning, importance and requirements of studying and following Ho Chi Minh’s studying style. Director of the Institute of Ho Chi Minh and Party’s leaders.